By LUDWIG VON KOOPA - This is a really hard game. On Tuesday, I wrote about me trying to get the Little Mac amiibo from Best Buy, and at the end I said, "I'll let you know what happens on Friday in regards to the Little Mac amiibo." ...It's Friday! The Best Buy employee — armed with the power of the inventory management system and a long look at the backroom storage — said it's out today! Let's drive down to the Best Buy (in bumper-to-bumper traffic) and pick it up! This makes the title somewhat relevant. 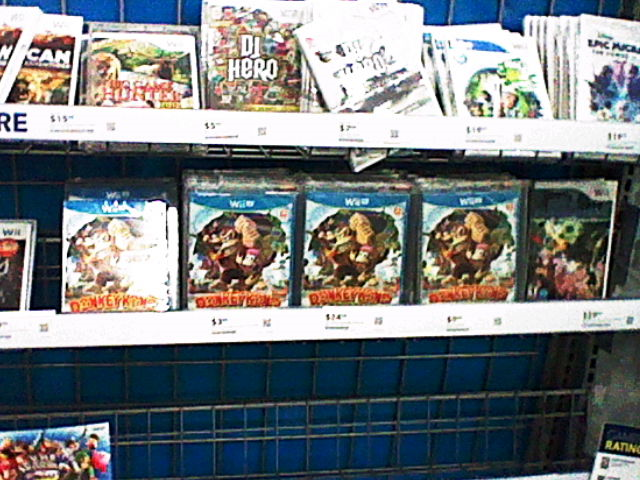 I guess they're making a huge push with Donkey Kong Country: Tropical Freeze this Christmas. Good. Annnnnnnnnnnnnnnnd long story short there is no Little Mac amiibo and the manager said it might be replenished on Tuesday's truck shipment. But this is a commentary website, so I guess I gotta have drawn out comments about it. Sure! So some more data. They are sold out of Little Mac amiibo already. How did they sell out when I arrived right after the work day ended on the first day Mac was released by that Best Buy with no fanfare? Well, since the release of my article on Tuesday, Best Buy has officially marked the Little Mac amiibo as coming out on the 19th on their website. Captain Falcon is coming out the 30th, along with Luigi and Pit. Diddy and Zelda came out on the 17th. Yes, they're all in the same wave, but two weeks apart from one another. I don't understand it either. I also don't understand why Mac gets his own special day, and why half of the wave is after Christmas. By the way, Nintendo's official site still does not give specific days for when the Wave 2 amiibo come out. Still just "12/2014". Did the people who bought out Little Mac's amiibo read this article and get there before me? Seriously, they shouldn't have known about it otherwise. ...In which case, I'm honoured that I made a difference and informed people, and yet I also regret informing people because it hurts me. ...I don't even know how they bought Little Mac's amiibo when the labels on where the amiibo were weren't updated. Compare to last article. Left to right: 3 Mario, 1 Donkey Kong, 5 Peach, 5 Samus. Donkey Kong apparently got moved closer to Mario, and apparently it's the same Donkey Kong amiibo (which does not bode well for all of those copies of Donkey Kong Country: Tropical Freeze pictured above). There are now four less Mario amiibo, but I believe that those are not from purchases, but rather Mario being removed from display because the dude doesn't sell. 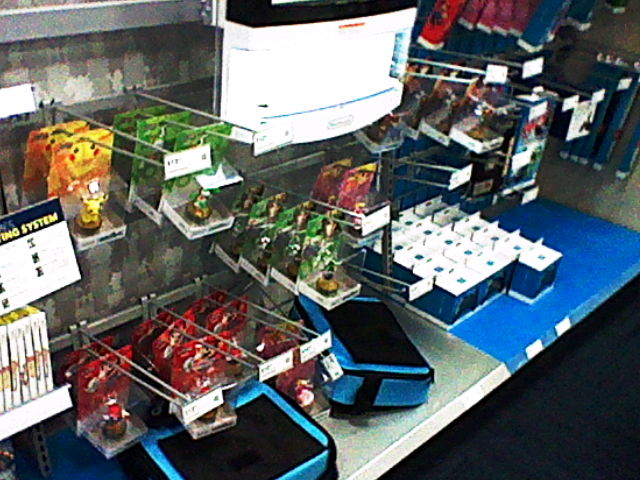 There are three more Peach and three more Samus, so those are selling enough to warrant more display! I wonder what Anita Sarkeesian would think about it. What did she (or her male minions in her place) say in her "Invisible Benefits" video? "I can walk into any gaming store and see images of my gender widely represented as powerful heroes, dastardly villains and non-playable characters alike." That is speaking from a male's perspective. ...Well, clearly not for guys. You got three figurines of a dastardly villain... and an ape. Do you realise the psychological damage done to men when they are forced to have their gender represented by a gorilla? All of the body issues! Meanwhile, over two-thirds of the on-display amiibo are women. Speaking of women, an older woman was buying Super Smash Bros. For 3DS in front of me. What did Anita (in the forme of a male minion) say about that? "When purchasing most major video games in a store, chances are I will not be asked if (or assumed to be) buying it for a wife, daughter or girlfriend." It turns out that she was buying it for her child (she volunteered that information). And later, another woman with her son was looking at some Skylanders figurines, and the mother had to keep reminding the son that he wanted the newer figurines from Skylanders: Trap Team and not the older Skylanders: Swap Force, and I guess he kept looking at the older ones! So in this case, the mom was more knowledgeable than the son (perhaps they played together), and neither the son or the mom were repelled from the store for any gender-related reasons. ...And no one in the store asked who they were buying it for. Speaking of repel, this is the second time in one week I've been to that Best Buy without buying anything. And you know, I feel bad for that. "Hey, maybe I should just get an eShop card and give it away for KoopaTV!" 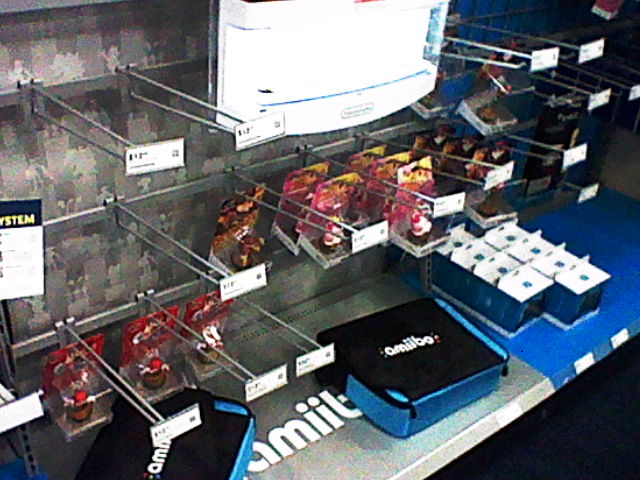 Ludwig got ten StreetPasses from being in that Best Buy, so it is still a great place to bring your 3DS. His StreetPass message directs people to go to "koopatv.blogspot", which is a great idea if you know to put the ".com" afterwards. Since you're already here, why not read some of the other articles KoopaTV has to offer? Try your luck with the random article feature at the top right of every page (if you're not on mobile)! More amiibo-related Best Buy adventures here, now at May 29 for Wave 4. Little Mac is finally found in a Best Buy.